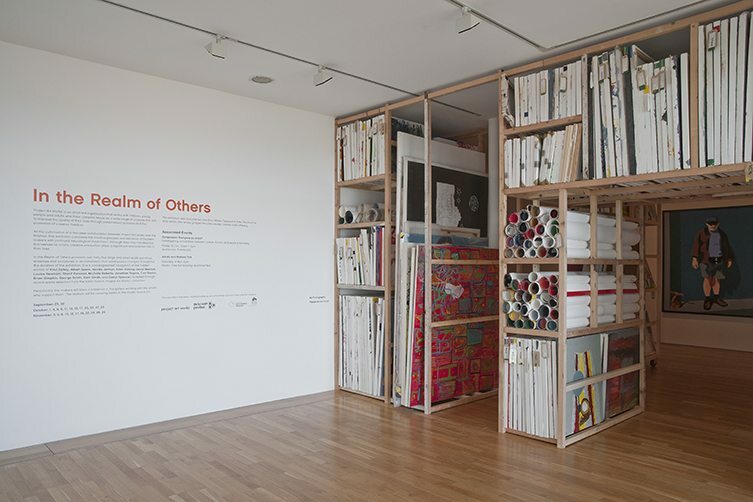 On the 26th of September 2015, a new exhibition entitled In the Realm of Others opened at the De La Warr Pavilion. For the staff working there, myself included, we were intrigued, excited and perhaps a little apprehensive. We expected that it would do well but at the same time, we were aware that this art show was unlike anything we had presented before. Individuals with complex needs have produced the work, and they all attend Project Art Works, an artist-led organisation established in 1997. The doors to Gallery One interest the public as they walk past. They turn their heads in curiosity and peer through the glass. They behold an unusual, impressive looking structure and it entices them to enter. They pause to read the information provided and admire the stunning framed doorway that is the Project Artworks archive. This contains rows of canvas paintings and drawings from the makers who regularly attend Project Art Works. The visitors hear some peculiar sounds as they read the information on the wall: they are initially puzzled until they realise that they can hear the splashing of liquid, the drips and dabbing of paint markers, the scratching of pencils over paper and shaken bottles of paint. This is an audible recording of the makers in progress.As visitors move through the first section of the gallery, they see Sharif Persaud’s self-portrait in front of them. There are murmurs of how wonderful it is. They turn their heads to the right and view the lively art works presented there. Marion Willis’s ink and pencil picture is coloured delicately and it has the appearance of a butterfly’s wing or an oriental fan. One guest describes Neville Jermyn’s Barbary Ape as ‘adorable’. Darryl Spencer also has his self-portrait here. Eden Kötting’s Dorothy Still Life picture evokes happy memories from childhood and brings forth recollections of watching the timeless film. The next section of the gallery has guests exclaiming in delight to each other. They had no idea how much variety and skill there would be in this exhibition. Carl Sexton’s multi-coloured dot paintings have been compared many times to famous artists like Jackson Pollock, sparking discussions about the magical, otherworldly quality it has and how much time it must have taken him to do. Michelle Roberts Birds in Nests painting introduces them to the abilities of a woman who perceives the world in the most remarkable detail and colour. Michelle also has other work displayed in the gallery and people quickly realise how exceptional her talent is. Darryl Spencer’s large process works inspire many thoughts; one in particular has tight, circular arcs of paint. Some people note that it looks like patterns in a kaleidoscope or that it has a likeness to jewels, freshly chopped fruit, bubbles or cells in a human body. George Smith’s three vibrant paintings are a particular favourite with children. The black and neon orange paint in one of them is particularly alluring. As an invigilator, it has been insightful, and at times highly amusing, to watch and overhear small children declare confidently to their parents that they know exactly what the images are. Young children talk about it with their own opinions and ideas, sometimes connecting with the artwork better than adults do. George’s younger brother, Sam Smith, has two of his canvases here too. Sam’s bright shades in his ‘pour paintings’ represent energetic bursts of spontaneity and a joyful sense of excitement that most adults sadly leave behind in childhood. His first one is a captivating mix of red, pale pink, blue and grey. Sam’s other painting contains explosions of blood reds, dark pinks and green. We hear frequent whispers about how extraordinary they are. Many of the visitors enjoy and appreciate the art, and strangers, who have never met before converse with each other. They step inside the darkened room to watch the video Modus Operandi, a video of the makers at work at the Parachute Club. This video provides a connection to the art; it shows some of the makers involved and links the visitors’ experience to the art itself. Albert Geere has nine of his creations in the gallery. These lovely, intensely colourful pictures of houses and intricate shapes are a favourite with all ages. Houses are a popular theme of Albert’s and the geometric elements and soft pastel colours give these special images their unique design. An allocated studio area allowed the makers to come in and produce work within the gallery itself. On certain allocated days, people were able to observe the makers involved in various projects, and to view the kind of sessions that Project Art Works provides. In the final days when the practical sessions were finished, the workshop wall had a selection of Polaroid photographs, revealing key moments from Project Art Works years of history. The drawing section of the gallery featured drawings by Darryl Spencer, David Marriot, Brian Simpkin, Louise Newham and Jonathan Rogers. These striking black and white pencil and graphite drawings have enthralled visitors, many of who have wanted to purchase them. Darryl Spencer’s Untitled (wave 1) picture is filled with curved brush strokes giving the picture a dream like essence with merging colours of purple, lilac, black, turquoise and dark blue. Visitors head towards the back of the gallery and spy a glass cabinet containing animals constructed from pipe cleaners. Gabriella Rapisarda’s Creatures are amazing and there are sea life animals, an eagle with tinsel wings and a charming little dragon with pink tinsel claws. These draw many smiles from the public. Another video that visitors are able to relax and watch is entitled No Church in the Wild. This beautifully filmed video follows some of the makers on a group expedition to the St Thomas a Becket church located in Fairfield, Kent. This is an attractive and remote location within the Kent countryside. At the back of the gallery, further surprises await the visitor. Jonathan Roger’s painting is a warm mix of red, pink and orange hues. Paul Colley and Cherry Lane have produced a huge black, white and yellow picture. This has a futuristic and galaxy like scene about it that has fascinated many visitors. Another of Michelle Roberts’ paintings Sea Life is a glimpse into a new and mysterious world of quirky creatures. Guests were encouraged to post their comments and questions in a book but they could also write on a square of paper and place it on the wall. What is art? How do we define it? Did the makers know they were creating art? Are we all artists in our own way? Questions such as these turned this section of the gallery into an educational environment for interesting and thought provoking debates. As an invigilator who has worked at the De La Warr Pavilion for many years, I believe that In the Realm of Others has been a resounding success. It has opened up a new world of discovery to both staff and visitors and has promoted diversity in art, health, disability and life. People have left the gallery with new ideas, an awareness of others and an experience that stays with them. Some have returned many times to see it again. For some it was a moving experience, for others it was enriching, and some felt motivated to have a go at creating art themselves or with their families. What has made this exhibition so appealing to visitors? The makers seem to live in the moment and enjoy life whereas we tend to worry constantly about the past or we fret about the future. Can we find that same kind of spontaneity and joyful sense of freedom in ourselves? Possibly, but only if we are willing to open our minds to the fact that we all perceive life differently and as long as we respect that, there is nothing to be afraid of with creating art. We can all find our ‘way’, just as the makers of Project Art Works have found theirs.